Discussion in 'MSI' started by vahdyx, Feb 6, 2019. 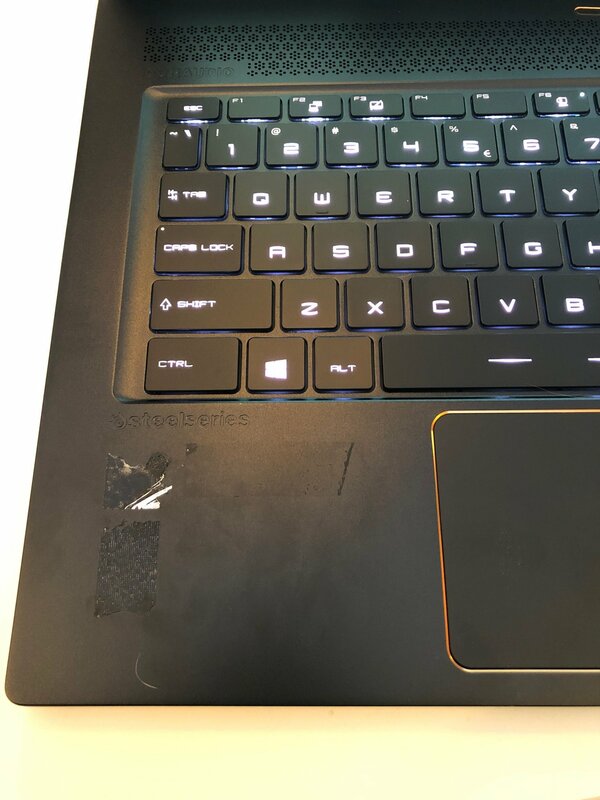 So I just received my MSI laptop and decided the stickers need to go... perhaps it was a stupid idea but anyone know how to fix the left over residue? Hmmm, others have recommended me something like "goo gone", but I haven't had this issue yet. I suppose it should help with your sticker situation. Was it generic advertising? Yeah one said something like “PC Gaming if the year” the other was RTX sticker, the other was Intels sticker and on the right side there’s a massive MSI sticker. I peeled all but the intel/rtx stickers off with no issue, one left a tiny bit of residue but warm water and a cloth took it right off. So took your idea with a warm washcloth and my wife’s hairdryer and it worked. I was concerned that googone may damage the finish so I wanted to avoid that. Achohol will make short work of that residue. Had that same issue and it took it right off. Alcohol (96%) or purified gasoline - that's what I'm using. WD40 will do it, apply it onto a paper towel, then wipe it off gently. This thread was better than expected. Now we have several options to get rid of the goo, and all of them using different components! ALLurGroceries, Papusan, t456 and 1 other person like this.